Preheat oven to 400 degrees F (200 degrees C). Bake pie crust in preheated oven for 10 to 12 minutes. Heat oil in a large skillet over medium-high heat. Saute onion and garlic until golden. Stir in the cooked broccoli and heat through. In a blender, combine tofu, soy milk, mustard, salt, nutmeg, ground red pepper, black pepper, parsley and Parmesan soy cheese; process until smooth. In a large bowl combine tofu mixture with broccoli mixture. Pour into pie crust. Bake in preheated oven until quiche is set, 35 to 40 minutes. Allow to stand for at least 5 minutes before cutting. 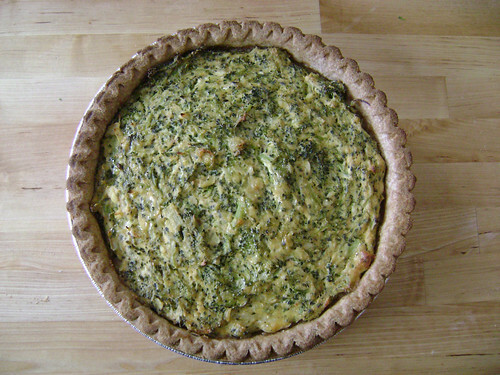 No comments for: "Tofu Quiche with Broccoli Recipe"